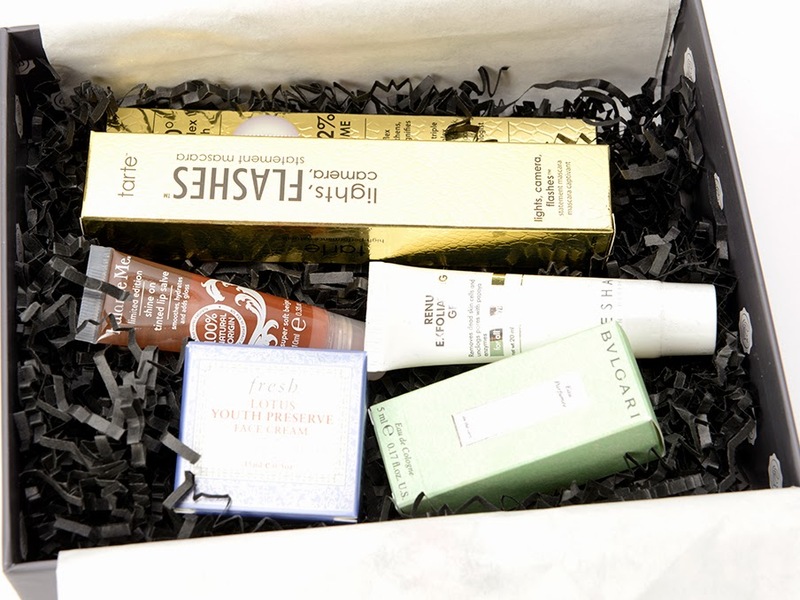 If you've been following this blog for a while, then you know that I don't have the greatest opinion of Glossybox. For me, most of the time, the products do not justify the price and after hearing umpteen stories of their horrible customer service (which I've never experienced), it's safe to say that I'll never be a regular subscriber. However, the occasionally do curated or collaboration boxes, and those bad boys are usually amazing. 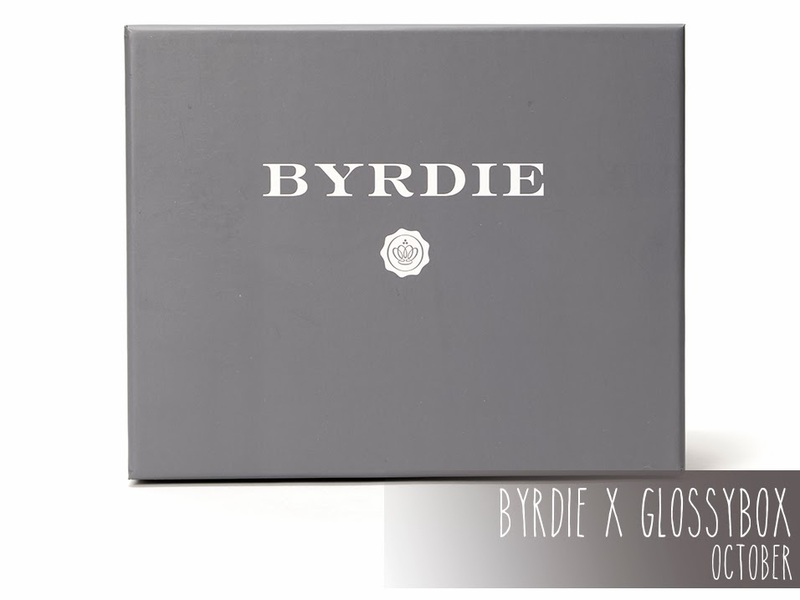 When I heard that they were teaming with Byrdie Beauty (the sister site of Who What Wear), I jumped on ordering a box. Want to see what I got? Keep reading. 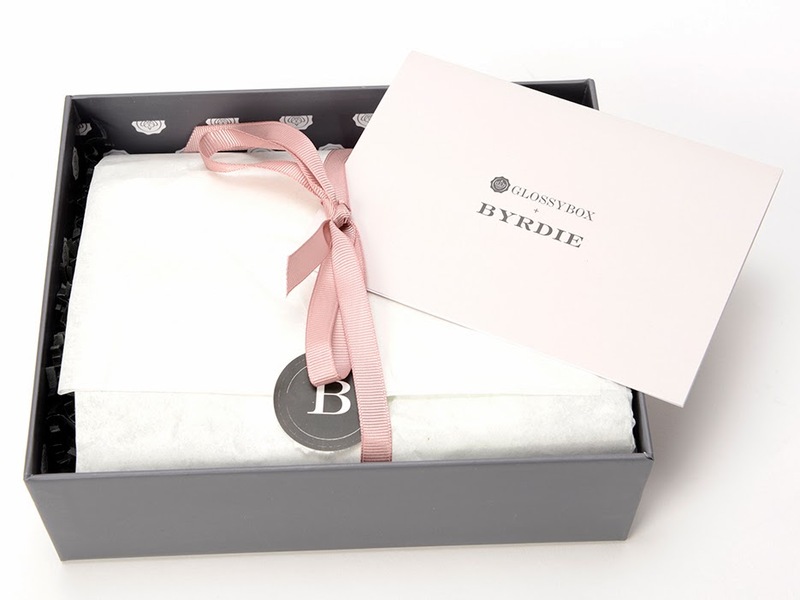 One thing that I will always commend Glossybox on is their packaging; it feels really luxurious. I don't know if you guys ever order high end makeup directly from the manufacturer (e.g. ordering Chanel directing from Chanel), but they really take the time to make a complete presentation out of it and Glossybox does this, too. 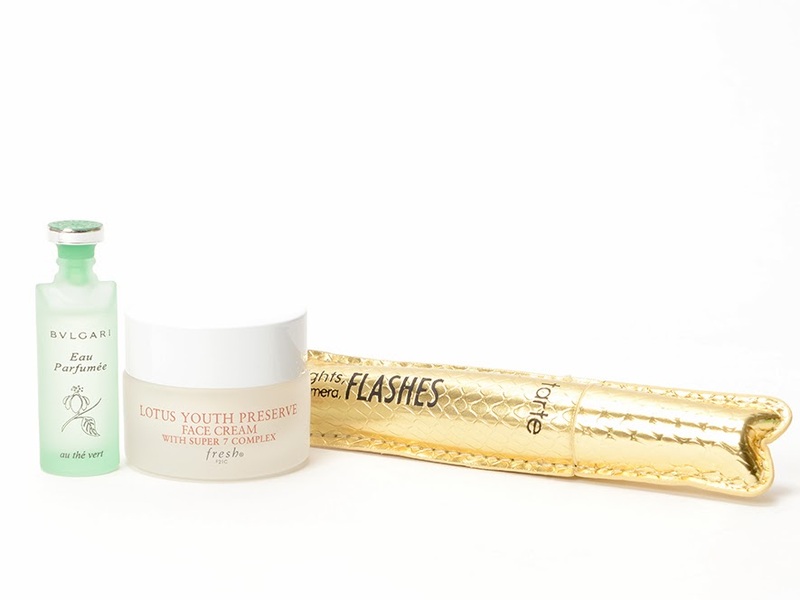 From left to right: Tarte Lights, Cameras, Flashes Mascara, Balance Me Shine on Tinted Lip Salve, Sesha Renu Exfoliating Gel, Bvlgari Eau Parfumée au Thé Vert Eau de Cologne, and Fresh Lotus Youth Preserve Face Cream. When I opened my box on Saturday morning, I'll admit, I felt a bit disappointed. I think I was just expecting something very similar to the Man Repeller boxes from January. Now that I've had a few days to look at this, I don't feel the same way; I'm actually pretty happy with this box. The Tarte and the Balance Me are full sized items; ringing in at $23 and $16.50, respectively. 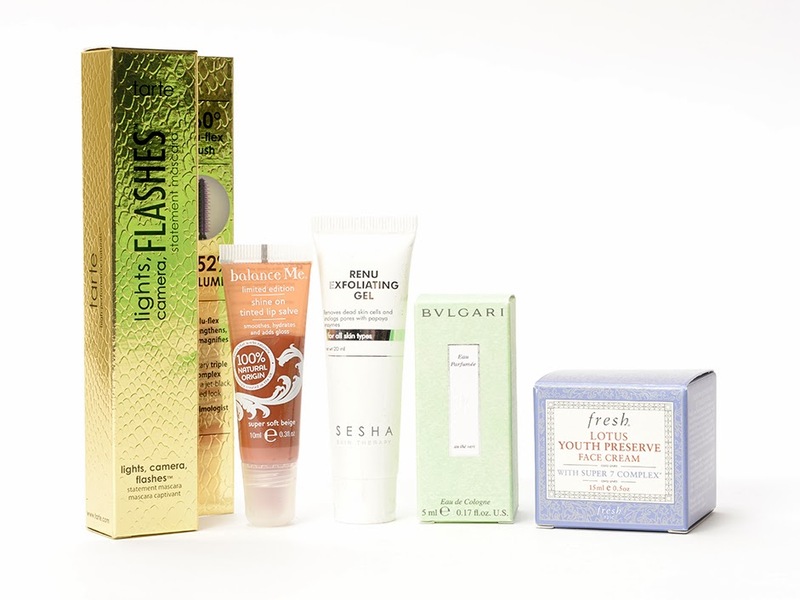 The Sesha sample comes in at $16.80, Fresh at $12.42, and Bvlgari at $5.78. This makes the total monetary value of the box $74.50. The only item that I'm really not excited about is, you guessed it, the lip salve. It's a natural product, so it's much thinner than a standard lip gloss, which I usually like, but this is extremely thin and makes my lips feel oily. I'll keep using it to make sure that I don't have a change of opinion, but I think that's a flop in my book. Other than that, I'm pretty excited to use the items. The Bvlgari smells great and light and fresh; a bit more of a spring/summer fragrance, but still nice smelling. I like the Fresh brand and plan to use this at night during the winter when my skin gets a bit dryer. Not to mention, for a face cream, this is a pretty big sample and should last a long time. I love Tarte's Lights, Cameras, Lashes mascara, so I can't wait to try this version. I'm a pretty big Tarte fan all around and this was the first "sneak peek" from this box, which was also worth more than the box itself. And last but not least, the Sesha exfoliating gel. It took me going to look at the company's website and doing some research on it, but I think that the idea behind it is pretty cool. You apply the gel to a dry face and it exfoliates the dry skin using papaya extract. It says to only use it once a week, so this sample should last a while as well. And that's the box. Thoughts on it? Let me know down below!